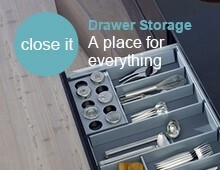 Tailored to You: our Hettich larder drawers can be purchased in different formats to suit your specific requirements. The 188mm high-sided drawer boxes ensure taller contents are stored securely, while optional dividers allow you to organise items further. 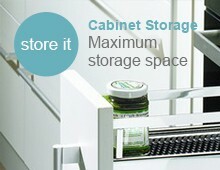 Shallower 108mm tall drawers are perfect for storing jars or tins. 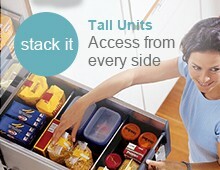 Simply select from the drop down menu how many drawers and of what height you require. Retro Fitted Drawers: supplied in kit form and designed for tool-less rapid assembly, and with the flexibility to position at any height to suit provisions. Please note, drawers must be positioned to avoid clashing with hinges, all required fixings and instructions are included. 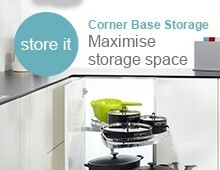 Larder System Comprises: full extending Quadro runners with integrated soft close, metal sides, backs and fascia's. Colour coordinated bases, 165° zero protrusion hinges for use behind hinged doors. Each pull-out can hold loads up to 30kg, sides back and front are a metal construction, finished with a luxury silver coating. When ordering; if your cabinet sides are 15mm, please choose the Related Runner Product, listed below. You will need one per drawer. Each internal deep drawer is designed for cabinets with 18mm thick sides. If you have 15mm sides, we stock the appropriate Quadro runners at no additional cost. Please contact us prior to ordering. Larder drawers make use of the full cabinet width. 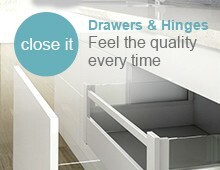 Therefore, if using behind hinged doors, the drawers must be positioned to avoid clashing with the hinges. 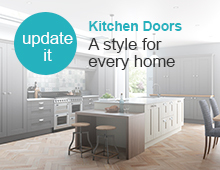 In addition, the cabinets need to be fitted with 165° zero protrusion hinges, so 4 are included in the set. Traditional hinges do not allow the door to open in line with the cabinet side, the door will be slightly stepped and prevent the drawer opening. For handless furniture, you may wish to upgrade to push to open Quadro runners, please contact us for pricing.